Thursday evening we attended a Saint Lucia musical recital hosted by the daycare that Helena’s daughter attends. 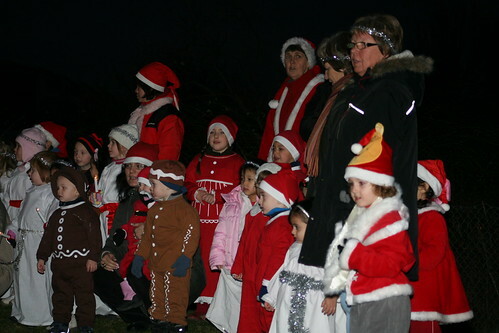 It was extremely cold outside, but the kids were all so adorable! Friday we struck out for our own in Malmo again, and spent some time in the Malmo Museum, which was wonderful! It’s a museum with art, historical castle artifacts, and an aquarium and zoo in the basement! It was quite a lot of fun to explore. 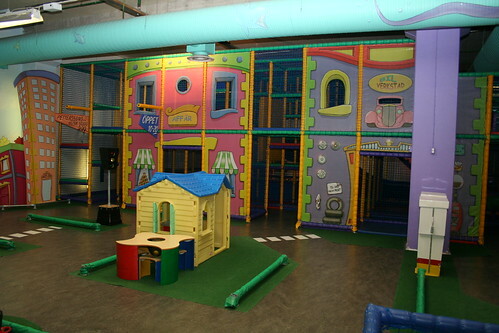 The plan for Friday evening was to take the train back to Burlov, where we’d meet Michael, and then take a bus back into Malmo to go to “Andy’s Playhouse”, a large indoor playground for kids. We took the wrong train, and ended up in Lund. Heading back we thought we were taking a train that stopped in Burlov, but instead it went straight on to Malmo. The train was packed, so Carina and I stood at the front of a car, while the twins sat several row behind us. At the front with us was a small group of extremely boisterous people, who at first made me feel very worried that we might have a bad situation on our hands. Suddenly, the guy closest to me offered me the beer he was drinking! When I declined he then had his friend offer me some of his beverage, which was explained to me as something homemade. I took a polite sniff, and quickly declined – it was clearly very potent moonshine! The guy next to me proceeded to talk my ear off while Carina was engaged by the girl in this group. As it turns out, they were all heading to the Marilyn Manson concert in Copenhagen, and although drunk they were pleasant enough to chat with. They continued to offer us booze, and even invited us to join them at the concert. It was at this time that we rolled into the Malmo station, which provided us a convenient graceful exit. Back in Malmo we called Michael to explain our situation. He told us which bus to take toward our destination, and he said he would meet us there. After several false starts we decided that the time spent trying to figure out the bus system would be better spent walking the dozen or so blocks to where we were going. This was, in fact, a big mistake, and we arrived at the destination bus stop substantially later than intended. Thankfully, Andy’s Playhouse was still open, and the kids (and adults!) got to enjoy a lively 30 minutes frolicking there. 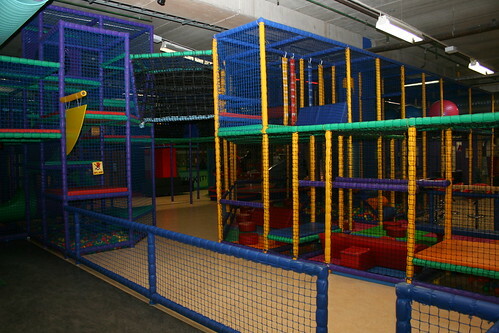 The facility was really nice: lots of mesh and rope climbing surfaces, tunnels and tubes, slides and obstacles. We played a bit of chase, and then simply ran abound before discovering a courtyard inside the maze armed with air guns that shot soft balls. We took turns shooting and being shot, and everyone had a great time. If we get the opportunity to go back, it would be a great place to spend several hours in order to wear out the kids! Friday night we stayed up extremely late chatting with Michael, Helena, and their friend Frank. I went to bed at 4:30, and Carina and Helena turned in about an hour after that. We were all up again at 7 AM in order to catch the train to Malmo. There I bought tickets literally just in time to board the X-2000 high speed train to Linkoping. Carina and the kids stayed at the platform while I purchased the tickets, and it was a scene straight out of a movie as I rushed down the platform, waving the tickets in my hand as the final boarding call was announced! Safely on board we had a quiet ride through the Swedish countryside. The train, to my surprise, had (for pay) on-board wireless internet, and the captive portal splash page showed a real-time display of the train’s position! We’ve now spent the afternoon with friends of Carina’s mother, who remember Carina from when she was a baby living here. They’re extremely gracious hosts, and we’ve had a wonderful time chatting with them and their children (and grandchildren! ), talking about the differences between Sweden and the U.S., as well as just sharing personal stories and getting to know one another.